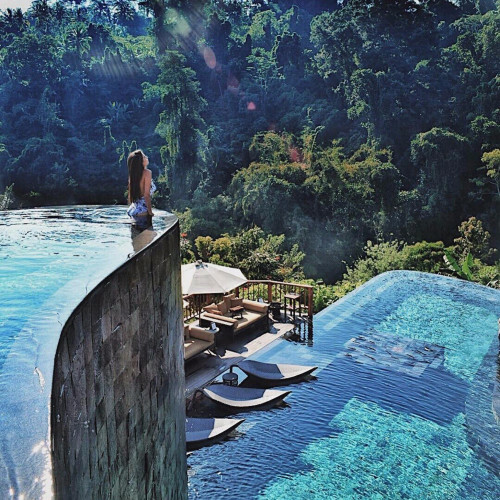 Why stay at the Hanging Gardens of Bali? Sadly, Iraq’s Hanging Gardens of Babylon, one of the seven wonders of the ancient world haven’t allowed tourists in for about two thousand years, so instead we’ve found you The Hanging Gardens of Bali - the world’s first seven-star boutique hotel and a must for all you lovebirds out there. Situated near Ubud, this award-winning resort rests in a valley surrounded by traditional rice terraces and overlooks the ancient Dalem Segara temple in the centre of this magical jungle island of Gods. The Hanging Gardens of Bali is the island's number one honeymoon destination but you don’t need to have just been hitched, you just have to feel the love! Why visit this exotically intoxicating destination? 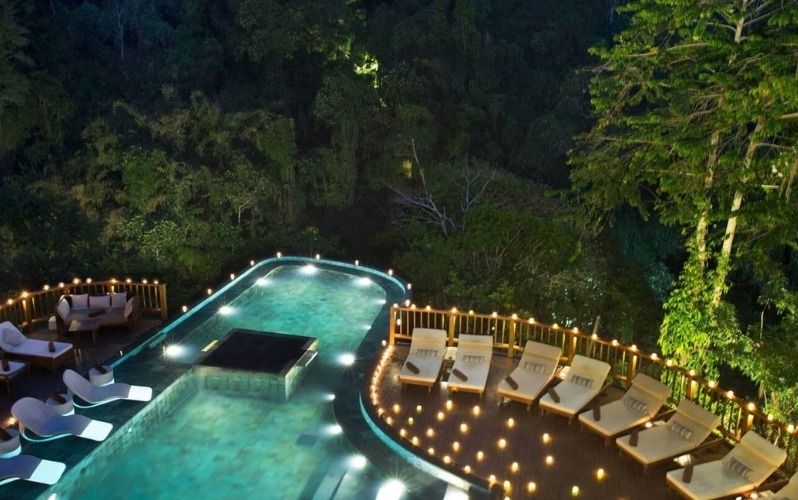 If you don’t fall crazy in love with the cocoa and coffee trees, bamboo forest, flame trees and orchids that make up this unique tropical paradise, perhaps the sight of your accommodation will sweep you off your feet. For, under those simple Ayung thatched roofs, your beau will surely carry you across the threshold of one of the hotel’s 44 private villas including the Riverside, Panoramic Villas or Majestic, Emperor or VIP Presidential Suite! Every suite combines contemporary and Balinese décor, with hand-crafted furniture, exotic fabrics, spectacular master bathrooms and open-aired dining areas. And speaking of dining - you may like to try the candlelit ‘Romance under the Stars’, dining for two on a volcanic rock pillar in what TripAdvisor and Condé Nast Traveller both voted “The World’s Best Swimming Pool”. Don’t fancy skinny-dipping? Try a gourmet picnic served in a secluded balé right on the banks of the holy Ayung River. 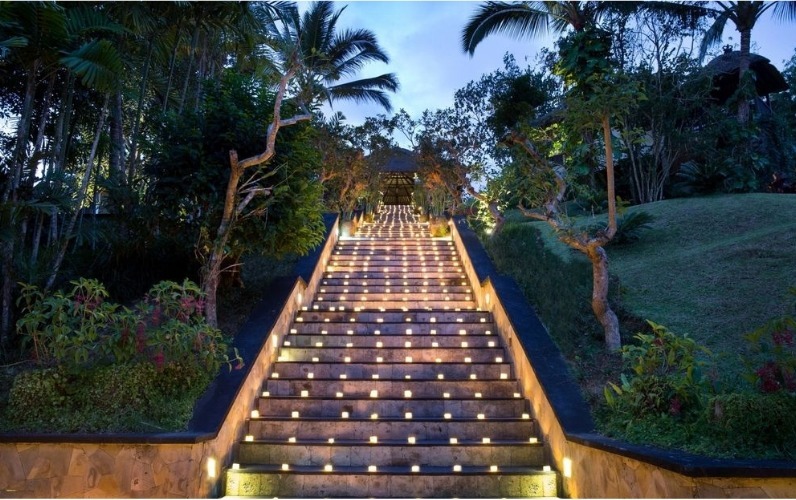 Finally, how about treating yourself and your loved one to an incomparable, signature spa and wellness package featuring ancient Balinese massage techniques to soothe the mind, rejuvenate the body and energise the soul?